Hard-boiled eggs are something that I typically leave to my aunt. She is the one who always makes deviled eggs for the holidays and she usually makes a few more so we can partake in our annual Easter tradition of “picking eggs”. Until I started doing the Whole 30’s, I rarely ate hard boiled eggs outside of a day or two surrounding the Easter holiday. Actually, as I’ve probably mentioned a thousand or so times, I didn’t even like eggs for the majority of my life and only tolerated them just a few times a year. Now I eat them all of the time. But for this recipe, I opted to go with what I believe is the classic preparation not involving anything but eggs and water of varying temperatures. 1. Place eggs in a large pot and fill with water until there is about 1 inch of water covering the tops of the eggs. 2. Bring to a rolling boil over medium-high heat, then reduce the temperature to medium-low and allow the eggs to boil for 10 minutes. 3. Prepare a large bowl filled with ice cold water and ice cubes. Once the 10 minutes are up, use a slotted spoon to transfer the eggs to the ice bath, making sure to shake off the excess hot water before emerging the eggs. 4. Allow the eggs to cool to room temperature before peeling. *A lot of people suggest that you crack the top or bottom of the egg to perfectly peel off the shell, but I’ve always had good luck with gently tapping the sides of the egg on the counter just until they crack and then the shell usually comes off in nearly half. 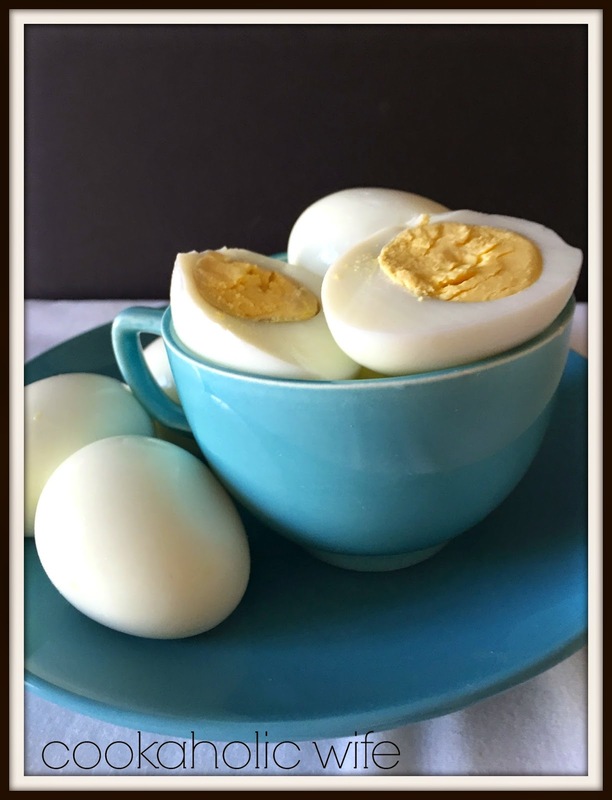 So with Easter quickly approaching, now you have a recipe for those wonderful hard-boiled Easter eggs for egg hunts or the start of a deviled eggs recipe! And if you are part of a family or group that also picks eggs, please let me know! I’d love to know who else shares this tradition!